What is a dæmon? it has nothing to do with 'demons' and their curved horns, red eyes, and skewers. Plainly put, your dæmon is you. Everyone has one. The consensus used to be that a dæmon was simply a reflection of a person's soul, but over time the community has come to see them more as a part of the subconscious assigned a gender, name, and a symbolic animal form. It is similar to totems since its your consiousness. European, American, Japanese and fisher martens are interchangeable for the purposes of analysis and only independent research will turn up anything that sets them apart for an individual. 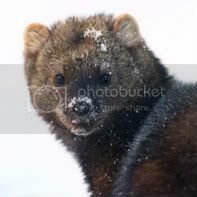 For example, fishers are known for their porcupine hunting, which broadly seems to be a display of general marten tenacity and inventiveness, but could be put to personal interpretation. 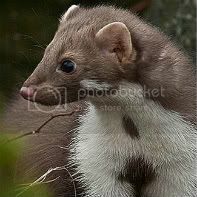 Exceptions pertaining mainly to sable and beech martens have been noted under the paragraphs they relate to. 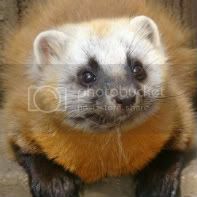 The Nilgiri marten is not viable due to lack of information. The yellow-throated marten has its own analysis, which you can skip to. The sections above also apply to them. It is recommended that you read the general marten analysis as well for comparison and context, although this is not at all a mandatory suggestion. Martens are strongly introverted and so need a lot of time alone. They dislike being put in a position where they have to talk to people they don't know and as such don't gain friends very often. Too much social activity can be really stress-inducing in high doses, especially if it involves crowds, loud noise or being put on the spot. When put in that sort of position, a marten will almost always become irritable and withdrawn, and will likely leave at the first possible opportunity. On top of simply being drained by social activity, there is a mixture of awkwardness, inability to understand how to make small talk and a general insecurity regarding being taken outside of their comfort zones at play to make this kind of situation stressful, and maybe even frightening, for a marten. If a marten is going to socialise, they would prefer it to be with a handful of good friends in a relaxed environment. Martens really resent being made to feel as if they have an obligation to spend a lot of time with people, so they are likely to struggle with outgoing friends who are not respectful of their need for space and quiet, and will probably outright avoid emotionally or socially needy people. A marten requires friends who understand that not always being enthusiastic about spending time together does not mean that they don't want to be friends. In general, martens make for very low-maintenence friends in that they're not the types to seek out attention, comfort, support or conflict very often. This also means that they don't tend to put a whole lot of work into maintaining relationships that are no longer convenient and will allow friendships to dwindle over time or distance without losing much sleep. They're fairly happy to terminate friendships that have gone bad, although that would be most likely achieved by distancing themselves rather than by confrontation. Martens can't really be described as loyal, at least not in the traditional canine way: if their friend is in the wrong, they have no problem telling them, and are unlikely to throw themselves to a friend's defense. As far as they're concerned, other people can and should look after themselves. That's not to say that martens make for awful, back-stabbing friends just because they are not doggedly loyal and protective; they are not the types to play friends false or betray their secrets. After all, martens don't gain close friends often and so stick to one set of people for long periods if possible. Someone befriending a marten shouldn't expect unconditional love and support and someone who is going to be selfless for them, rather what should be expected is someone who is non-judgemental, who encourages others to face up to their problems and who will always give the most logical and truthful advice they can. If they've wronged a valued friend, a marten will usually own up to it and apologise. They are not really grudge-holders and prefer not to prolong tension or conflict. Once a marten has really opened up to someone, they would prefer not to lose them, even if they don't seem to make it obvious. They're not overly suspicious types but they don't trust just anyone, and having opened up to someone who isn't their friend anymore is likely to make them feel a bit vulnerable. While martens are reserved, quiet and generally reclusive, they can be brought out of their 'shell', so to speak, by the right people. A sure sign of affection is the marten becoming more talkative, cheerful and playful in someone's presence. They actually love to laugh and joke and get up to silly things with their close friends, although they're not always in the mood for it. They're likely to have a reputation for being a bit of an awkward, sullen hermit because they are so uninterested in opening up to anyone they don't know well, but their friends would be privy to the elusive clownish side of them. Hierarchy is largely an alien concept to martens who don't take enough interest in people and social interactions to perceive and abide by social power relations. They don't respect anyone beyond the basics unless they deserve it, regardless of whether they hold authority or not. They're not the types to be bossed around, lead astray or talked into doing things they don't want to do, and they're not interested in climbing social ladders. Martens are not particularly manipulative, especially when it comes to people, as they really have no interest in controlling or using others. They can be made to feel intimidated but usually can't be intimidated into doing things. They don't really have an intimidating presence of their own unless they're very angry and rarely try to actively dominate others. They can, however, assert themselves over others when they have need to, such us in competition or to get rid of someone from their territory. Martens are somewhat arrogant and self-absorbed and so put themselves first, but this is not the same as seeing themselves as 'higher' in a hierarchical sense. Martens will always opt to work alone if they can. They shun responsibility to others and don't like being relied upon, so are not particularly good at fitting themselves into a team structure. They will almost always do one of two things if forced into a team: slack off as much as possible, leaving almost everything to the others, or scorn the team plan and do everything allocated to them separately and in their own time. They cannot function well under scrutiny and despise bossy or nosy people. While martens may usually be quick-thinkers with inventive, problem-solving minds, they tend to freeze up and get terribly scattered when put in a spotlight. They also really work to their own meandering schedule and attempting to make them conform to an organised timeframe is going to be a fruitless endeavour. They always leave work until conditions are precisely 'favourable' to them and only them, which may often turn out to be the last minute. Deadlines are the bane of their academic careers. Needless to say, martens are really 'go with the flow' types and will likely baffle others with their seemingly disorganised ways. However, that's not to say that martens are entirely adverse to planning. A marten will never leave something to the point where it cannot be done and, unbeknowest to others, probably has some sort of back up in place for if something fails. It might look like they live entirely in the present, and to a great extent they do, but they're not the types to put all of their eggs in one basket. They like to keep their options open and would be sorely disappointed with themselves if they ever lost everything in a gamble. They're not uptight, neurotic planners at all: they just have a bit of what they'd consider common sense when it comes to these things. Martens are not perfectionists and tend to live by “sort of”s and “that'll do”s. They'll have a go at most things that catch their eye but won't feel the need to be an expert at any of them. Even with something they really enjoy there's probably no drive to prove they're good at it to others unless some kind of direct competition comes up. They're dabblers. They cut corners. They're lazy sometimes. They're a bit disorganised. They'll settle for something else if their first option isn't available. They'll make do until something better comes along. Their work doesn't have to be perfect, it just has to be good enough, and no one elses' standards matter but their own. It probably doesn't need saying that criticism doesn't bother them much, although the constructive sort is always noted and kept in mind for next time. EXCEPTION: Beech martens are capable of being more specialised and focused when they put their minds to it, although they'll usually specialise in something that doesn't take too much work. When they do actively go after something they're even more sharp and capable than other martens and are more likely to become experts at something for longer. Martens are very inquisitive and do love to learn, even about things which are probably useless. They always keep their ears and eyes open to the things going on around them and are constantly stashing away learned titbits for later, when they're not caught up in their own inner world, that is. They have no qualms whatsoever about using bits of other peoples' ideas (modified, of course) for their own projects, although they are protective of their own ideas. Martens are quite easily distracted and find it difficult to vigorously apply themselves to one thing, especially when there are much more interesting thoughts and daydreams floating around their minds, or easier tasks they could be doing instead. Martens are not particularly emotional beings, at least not outwardly. Insults tend to roll off of them and they're generally unruffled by obstacles or disruptions. Hurt, upset, anger and so on tend to be dealt with internally, and time alone is needed to process shocks or bad news. They make their decisions based on what makes sense logically and can be oblivious at times to the feelings of others. Even when they do recognise peoples' emotions and opinions, they don't tend to put a lot of value in them and find it difficult to put themselves in others' shoes sometimes. They can be insensitive, both in their actions towards others and in the way things don't often affect them. Not at all obsessive or clingy in their relationships, martens really dislike it when others show those traits towards them. They're more tough love types and express affection through play and teasing. Martens are unlikely to start conflicts as they are generally avoidant of confrontation. Despite self-confidence and an easy-going attitude, martens can have something of a fearful streak and much prefer not to make themselves vulnerable. They tend to have strongly defined 'comfort zones' and although they are not usually anxious and do enjoy trying new things, it is quite clear to everyone when a marten has been pushed past their limit or cut off from backing out of something because they become anxious and potentially aggressive. Healthier martens have much wider and more relaxed comforts zones than unhealthier ones. Martens are much more likely to wriggle out of a conflict than go in guns blazing and are overall more passive-aggressive than outright fierce. They tend to retaliate to things indirectly and try to give off warning signals before blowing up at anyone. They are not quick to anger anyway, but if put in a corner or particularly riled, martens can be vicious. 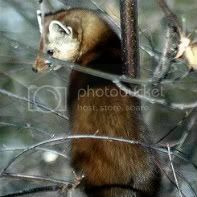 EXCEPTION: Beech and sable martens are less worried about being exposed and vulnerable than other martens. Martens are all independent sorts and probably dislike looking incapable or asking for help, which also makes them a little reluctant to help others unless absolutely necessary. They are territorial and highly value their own privacy. Rather than making it clear in a language everyone can understand, they tend to be more indirect and try to give off signals and create hints so that others will know not to invade their space or meddle with their things. If someone does this, however, they will react fairly directly and aggressively, contrary to their usual non-confrontational habits. There are those friends, however, with which they can coexist with more closely in peace, so long as everyone respects each others' possessions and needs for time alone. Martens tend to be fairly protective of their things and ideas, much more so than of people. Being secretive and wary of others preying upon their ideas, things and, possibly, even their feelings, martens are guarded individuals who keep their assets close and rarely feel the need to tell everyone about things happening in their lives. EXCEPTION: It has been said of European martens and sables that males may offer some protection if a female is raising his young in a den within his own territory. Whether this is true of all martens is unknown, but it suggests that they can be sort of distantly protective of people they have invested a lot in, if it is convenient, at least. Despite being territorial, martens don't necessarily stick to a place and are quite willing to adapt and move if it would favour them. They are generally quite adaptable, so long as their comfort zones are not violated. They are actually fairly active, if in some cases only intellectually, and it is only under extreme stress that they really shut down, regardless of how reclusive and passive they might look to an outsider. very accurate, i'm impressed. Where's your reserch came from?